Light and airy crystal snowflakes dancing down from the wintertime sky; sounds like a picture-perfect image of the season, right? That’s only until those snowflakes end up in your gutters and cause a nightmare of roof and gutter damage. 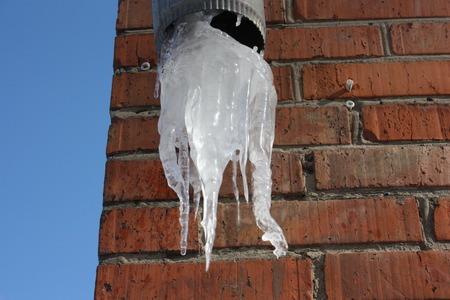 Here are some ways winter weather causes gutter freeze and how to prevent it. The unforgiving winter weather often results in ice buildup in your gutters. When melted snow and ice cannot drain properly, the menaces collect and run off over your gutters, creating icicles. Ice barriers create blockades that prevent drainage of melted snow. Over time, snow built up on your roof begins to melt, and the runoff ends up in the gutters. Once in the gutters, the runoff re-freezes, creating an unwavering icy obstruction. Damage occurs to your roof and fascia in this situation when water finds its way beneath shingles and plywood. Often blizzards and strong snowfalls cause heavy snow that bears down on your roof and gutters. Gutters can succumb to this extreme weight and end up breaking away from your roof. Even the strongest of gutters easily become weakened by heavy snow buildup. Before winter gets too harsh, clear out your gutters of debris to prevent clogging complications. Clogged gutters only help ice collection and ice barriers along. Remember: any water that remains in your gutters due to clogs before winter will likely freeze in the icy temperatures. Clear the snow from eaves and gutters soon after a large snowfall to prevent your gutters from freezing and clogging. Consider using rock salt to help melt the ice in your gutters. Heated gutter cables could also help rid unwanted ice. Take some time to inspect your roof for any structural problems. Are the gutters attached to your house with no gaps? Do you see signs of water damage, such as staining or rotting? Finding signs of structural damage allows you to fix the problem before it gets out of hand. As superstars in effective water management, we’ll protect your home through years of harsh weather with a sturdy gutter system. Protect your home with Alaska Premier Gutters, a full-service gutter installation company providing top-quality gutters suitable for tough winter weather.